My name is Garth McNary. I am guest posting on Marie’s blog today to tell you about a new book we just finished reading. The Good, The Bad, and the Guacamole by Rebecca Adler. I have never guest posted on a blog before, but if Lenny the Chihuahua in this book can have a blog, I figured why can’t I guest post? I sat next to my Mom on the couch and slept while she read the book, so I feel quite qualified to comment. This is a fun book about Josie Callahan who is writing and waitressing her way through life in the small town of Broken Boot, Texas. When Josie’s best friend, Patti is accused of murdering an up-and-coming country singer who was traveling through town, Josie can’t sit ideally by and watch her friend be accused of a crime she did not commit. Josie and Lenny are fearless as they question neighbors, band members, and anyone else they feel can help them clear Patti’s name. It is clear that Josie is fiercely loyal and loving to her family and friends. Her character shines through as a favorite part of this book. She isn’t afraid to step out of her comfort zone if it means standing up for those she cares about. 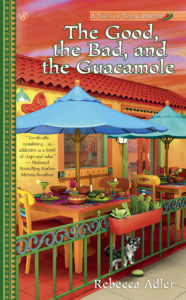 If you’re a human, grab yourself a margarita and some chips and guacamole and snuggle in with this book. If you’re a furry friend and see your human grabbing these items, snuggle up next to them and get ready for a nice long rest. The book is one they will be sitting with awhile (it’s tough to put down!) It is a fun read and you are sure to enjoy! I received a free copy of this book in exchange for my honest review. I would like to thank Great Escapes Virtual Book Tours & Penguin Random House Publishing for the opportunity to review. 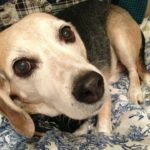 About the “Author” – Garth McNary is a 14 year old rescue beagle from Cedar Rapids, Iowa. These days he enjoys eating, sleeping, and spending time with the three little human kids who love to run circles around him all day long.